Dial Books for Young Readers, New York, 1997. First published in Great Britain in 1996. I'm posting a review of this Old Favorite in response to Travis Jonker's critique on his 100 Scope Notes blog of the current best-selling children's book, The Rabbit who wants to fall asleep. You see, I believe that if you want mesmerizing and hypnotic in a children's bedtime book, you actually don't have to sacrifice lovely pictures and beautiful, lilting language. When my son was a toddler, my then-husband brought this book home after one of his trips to England. It was the British version, so the title was The Baby Who Wouldn't Go to Bed, but all else was the same. My son couldn't keep his eyes open when we read this book to him. Before long, he wouldn't let us read it at bedtime, because he knew full well it would make him fall asleep. The book starts with the boys mother telling him it's bedtime. But it's still light, because it's summer, and the boy doesn't want to go to bed. and the mother couldn't catch him. The boy drives into a lavish dreamscape in his little red car, with a determined look on his face. The boy meets many creatures and things on his journey and asks them to play, but everyone is much, much too tired. The language is rhythmic and mesmerizing -- but definitely not in a boring or didactic way. before he met a tiger. But the tiger was too tired. "Come back in the morning. I'll play with you then." The pictures have the soft golden light of a long summer sunset. as a train rolled by. "Race you to the station," called the boy. But the train was too tired. "Nighttime is for resting, not racing," said the train. "I'm going home to my depot, and so should you." Of course, parents do not need instructions to read all this in a sleepy, tired, drowsy, weary voice. When he meets musicians, they're too drowsy to play music for dancing. They suggest that the boy give them a ride home, and they'll play a lullaby instead. and soon the musicians were sound asleep. It had fallen asleep too. The boy tries to get help from the moon hanging in the sky, but even the moon is too tired! And even the moon closed her eyes and dozed off. Soon, the boy is the only one awake, and all the world around him is sleeping. But there was someone else who was not asleep. but couldn't go to bed until the boy did. And the boy hugged her. The picture of the mother holding the boy here is suitable for framing. One fun thing about the book is that the dreamscape of the boy's adventures matches the toys and furniture you'll find in his room. The language is so lovely, the paintings are magnificently soft and warm and beautiful, and the tired, tired creatures and things will get any little one yawning. So my suggestion? If you want to hypnotize your child at bedtime, do it with delight. 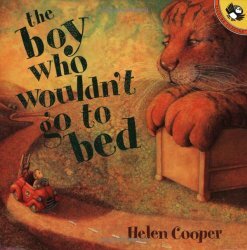 Try The Boy Who Wouldn't Go to Bed. Put some sleepiness in your voice, and I challenge you to stay awake, let alone your little one. Because, after all, nighttime is for snoring, not roaring; dreaming, not parading; and resting, not racing. Good night!